Child-friendly? 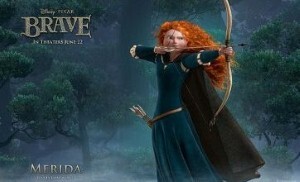 Pixar has been delivering quality animated family films for nearly two decades, and Brave is no exception. It's blend of great storytelling, compelling characters, strong morals, adventure and humor makes this latest effort enjoyable for kids of all ages. Let's face it – the second you see that little desk lamp hopping across the screen in a movie trailer, it's pretty much a guarantee that the film is going to be the must-see animated adventure of the season. Joining the ranks of Toy Story, Monsters, Inc., The Incredibles and WALL-E, Brave certainly has a lot to live up to in terms of the Pixar pantheon, but even the company's weakest production to date, Cars, was a commercial and critical hit. I have to admit, I was a bit thrown off at first seeing humans starring in Brave instead of lovable machines, living playthings or odd creatures that usually comprise the cast of a Pixar film. However, as a huge fan of Braveheart (FREEEEDOMMMMM!!! ), I couldn't resist the shock of red hair and thick Scottish accent of the main heroine. The story follows the young Scottish princess Merida (played by Boardwalk Empire's Celtic beauty Kelly Macdonald), who lives with her parents King Fergus (the ever-hilarious Billy Connolly) and Queen Elinor (Emma Thompson) in the kingdom of DunBroch. After receiving a bow and arrow for her birthday, Merida begins to long for a life of excitement and peril as an adventuring archer. However, as the customs of her homeland demand, Merida must wed a suitor in order to become queen one day – resulting in ancient Scotland's equivalent of an angsty teenage runaway (I bet William Wallace wouldn't put up with that type of behavior!). Of course, there's plenty of kilt-related, exposed-buttocks humor to help kids realize that the Scottish highlanders are just like us… except with a lot more blue facepaint and a near insatiable bloodlust – just kidding on that last one, this is Disney after all. While I usually love to grumble and groan about kiddie flicks, I've always been of the opinion that Pixar can do no wrong, and Brave certainly proved that. And even if you don't end up loving it, you'll at least be in the mood to watch Mel Gibson slice and dice some royal Englishmen when you get home. Child-friendly? In true Pixar fashion, Brave offers an enthralling family film that delivers in just about every way without dumbing down the content for kids – something I see too often in children's movies these days. With a great cast of voices, beautiful animation and a story of bravery, excitement and overcoming gender adversity, I would recommend that every parent take their little ones to see Brave.